Have you ever exercised and felt that you were not achieving the results you expected? Or worse, have you developed pain or worsened an already painful condition with exercise that was supposed to help? Have you been told by a trainer or physical therapist that your glutes are not firing or you have poor balance and you just can’t correct the problem? These are very common issues that I hear about in my practice that can have multiple causes. The first thing to examine is the program itself – what exercises are being done and are they even appropriate for the individual based on their health history and present condition. Very often I see people doing exercises that they should definitely not be doing because they are harmful and will cause injury. Unfortunately I also see many trainers and specialists prescribing these exercises. The second thing to examine is form – are the exercises being done properly. A good exercise, if done incorrectly, can be a bad exercise. Always be meticulous with form. The purpose of exercise should be to improve our health, whether the goal is increasing strength and endurance, rehabilitating tissue, or correcting movement patterns. The above are the very obvious reasons and should always be ruled out first. But if the exercises are appropriate and being done with correct form and the issue is still present, there may be another less obvious culprit. This hidden hijacker of a good workout results could be fascial tension. You may have heard of fascia recently, as it getting much attention due to research, which it deserves. Fascia is connective tissue that literally wraps and connects every structure in the body. To visualize this, imagine removing every organ, muscle and bone. 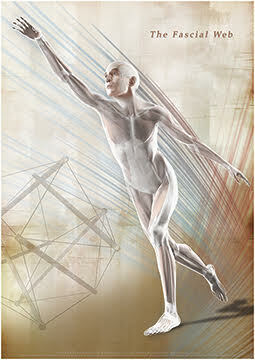 If we were to leave all the fascia intact, we would have a 3D outline of the entire body – a completely continuous web. Fascia is also a sensory organ. Another recent discovery is that there are more sensory nerve endings in the fascia than there are in the muscle. These nerve endings provide information to the brain and spinal cord about position, tension/stretch and pressure – a sense of where we are in space and what is happening to keep us there. Keep in mind that most of this is happening without us even realizing it.